For those who love the sea the favored Skip Jack for those day trips bring fond memories! 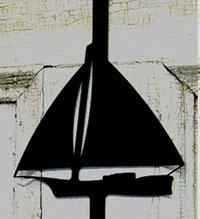 This hanger is powder coated a black texture and will endures indoors or outdoors. It is 14 inches in length.